The Digital Gift Card is a dematerialized card that can be used on the platform Ecobnb to book eco-friendly stays. Here are the Answer to the most Frequent Questions on the Gift Cards, and the Terms & Conditions of use. The digital Gift Card is a dematerialized card sent via email to the person that purchase it. A prepaid payment card available for different amounts (10€, 50€, 100€ et.) that can be used on the platform Ecobnb to book eco-friendly stays all around the world. Every gift card is composed by a unique code of 12 digits and has validity of 12 months starting from its activation. You will receive the gift card per mail from Ecobnb after the purchase that you can do at this link. Do you want to know more? 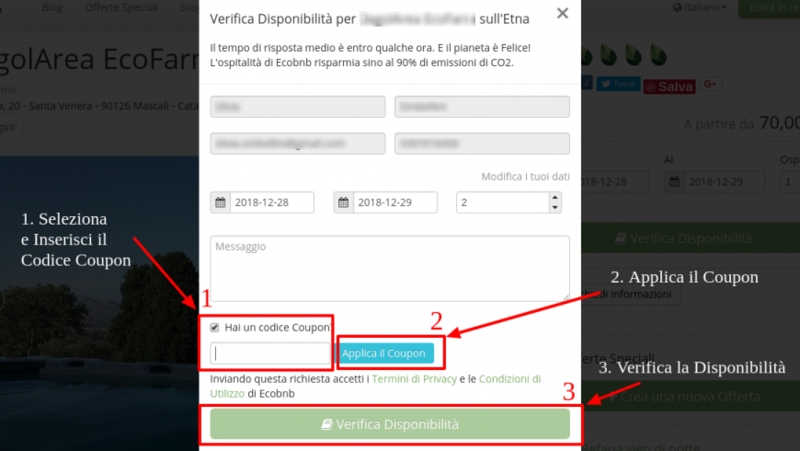 Here you will find the most frequent answers for the gift card of Ecobnb and the Terms & Conditions to use it. Good reading. How to purchase an Ecobnb Gift card? You can purchase your digital gift card on this page: https://ecobnb.com/buy-giftcard. Choose the amount: For example: 20€, 50€, 100€, or other amounts. Insert a message for the beneficiary, that will compare on the Gift Card. Now you have to accept the terms and conditions of the gifts card (that you will find in the following part) and click on “Continue”. In the following page you have the chance to pay with credit card or via paypal. How do I receive the Gift Card of Ecobnb? After the payment you will be addressed to the page of your gift card. In this way you can save it and print it. The Gift card will be sent also via email to the mail address that you have specified at the moment of the purchase. Which is the validity period of the Gift – Card? The gift card is valid for 12 months starting from the purchase. In what consist the digital Gift Card of Ecobnb? The gift card consists in a unique code of 12 digits that can be inserted on the platform at the reservation moment. If it was specified the email address of the addressee of the present, the code must be used with that email agree at the moment of the sending of the requests of reservation. How can I use my Gift Card on Ecobnb? First of all, go on the web site of Ecobnb, discover our green propositions and choose where you want to go between thousands of eco friendly destinations in Italy and in the world. Send one or more request of availability (see the following image). Remember to insert all the required data, to select “You have a Coupon Code” and to specify the code that is the number with 12 digits of your digital Gift Card and to click on the button “ apply the coupon” (that will verify if the inserted code is correct). Wait for the availability answer of the accommodations (if you are not satisfied, you can send it another) and once you have received the availability, confirm your booking. The term “Gift Card” refers to the digital gift card of Ecobnb. The gift card of Ecobnb can be used on the platform https://ecobnb.com to book nights, holidays and green experiences, after the availability check of the accommodations. The reservations with Gift Card follow the instructions present at the point “3. Reservation”. Other reservation procedures are not valid. If the total of the reservation is superior of the value of the Gift Card, the difference should be payed using another payment method used by the accommodations. If the total cost of the reservation is inferior to the value of the Gift Card, the total of the purchase order will be subtracted from the final payment of the Gift Card. You will receive per mail another gift card of the value of the remaining balance. No will further expenses will be applied for the use of the Gift card. Step 1. The client send one or more availability requests with Gift Crd starting from the page https://ecobnb.com, choosing one or more eco-friendly accommodations and by specifying all the data, included the code of the Gift Card (unique code of 12 digits ) that must be necessary validated online following the instructions of the site and clicking on the Botton “Apply a coupon”. The client must communicate the real informations or Ecobnb will have the faculty to oppose to the reservation and purchase of the gift card. Step 2. The client waits for the answers of the accommodations that can receive per mail at the email address specified at the sending of the availability requests. If an accommodation does not answer within 48 hours it is to be considered as non available. Step 3. The client reserve an eco-friendly holiday that prefer between the availability received via mail trough the platform, answering within 48 hours from the received Availability Offer. If not satisfied, the client can send new request of availability for the places or different periods. Once the reservation is confirmed, the gift card should be considered used and no more usable. Step 4. The client receive per mail the details of the confirmed reservation, together with the direct contacts of the accommodation and possible reminders from Ecobnb to remember the confirmed reservation and ask for a feed back over the holiday. Every reservation that will not follow these steps, such as telephone contact and direct agreement with the accommodation, will not considered valid for the reservation with Gift card. The digital gift cards and the remaining balance of the gift card have a validity of 12 months from the date of emission of the gift card, that correspond to the purchase date oft he Gift Card. The Gift Card, even if partially used, can not be recharged, resend or converted in money. Once confirmed the reservation, the amount of the Gift Card should be considered spent and no more refundable. The risk of loss and the ownership of a Gift Card can be transferred to the buyer at the moment of the electronic transfer of the Gift Card to the buyer or to the addressee or at the moment of the delivery of the courier, according to the different eventualities. We decline every responsibility for loss, theft, destruction or use non authorized of the Gift Card. The Gift Card should be used with the same care adopted for the cash: Ecobnb will not substitute the Gift Card and will not refund its values in case of loss or fraud. If an illegally generated and obtained Gift Card will be used to book or purchase on ecobnb.it, we have the right to close the counts of the clients and to charge the amount of the orders on alternatives payment method. Ecobnb excludes every guarantee, expressed or implicit to the Gift Card, included, by way of example, guarantee expressed or implicit of marketability or eligibility for a particular goal. If a Gift Card is not functioning you can request and we will be responsible for the replacement of the Gift Card. The legal provision applicable do not allow to predict limitations of the guarantee, such as exclusions and responsibility limitations for some damage, some or all the exceptions or limitations stated will not be applicable and you may have further rights. Choose the amount. For example: 20€, 50€, 100€, or other amounts. Step. 2: Finalize the purchase by validating the desired payment method (credit card or PayPal) and complete the other required information. Step. 3: Receive via mail the recap of the purchase and the age of the Gift Card containing the unique code of the Gift Card. If it is a present, you can print the page and create a niche card or simply send the link via email to the adressee. We apply the General Dispositions of use and sale of ecobnb.it (Terms and general conditions on the web site). The Gift Cad emitted by Ecobnb s.r.l., social enterprise of Italian right. When you buy, receive or use a Gift Card, you accept that present general conditions of use of the Gift Card are regulated by the Italian law. We reserve the right to modify the present conditions at our discretion. The present conditions are applicable according to the limits expected by the law.